TravStar1 Point Of Sale SystemManager's Work Station Daily ProceduresHow Do I Backup the Manager's Work Station? How Do I Backup the Manager's Work Station? 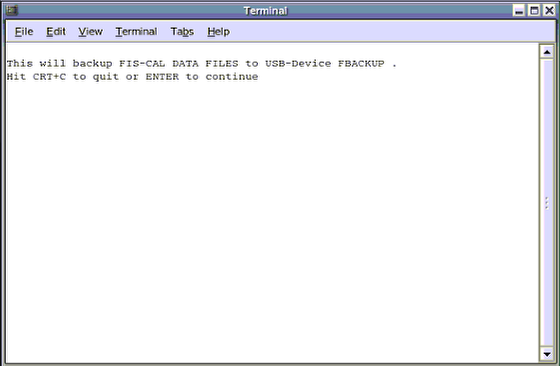 This lesson will teach you how to backup your Manager's Work Station information to a USN drive. Plug your fiscal USB stick into the USB port on the Manager's Work Station. From the Daily Procedures tab, click on the "Backup" button. From the Terminal screen, press the enter key on your keyboard. The backup may take a few minutes to complete. You will see several lines scrolling in the Terminal screen. When the backup is complete, you will see a message similar to above. Check and make sure the last file backed up has the current date and time. Then press the enter key. Your backup is complete. Note: Every backup is named by the day of the week. 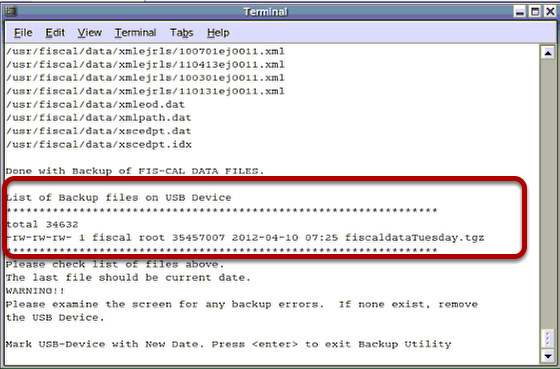 Once you have ran your backup utility 7 days it will start to override past backups. Also, if you run a backup twice in one day your first backup will be overwritten. Prev: How Do I Run the Price Change Report? Next: How Do I Check and Correct Communication Issues between the Manager's Workstation and the Register?